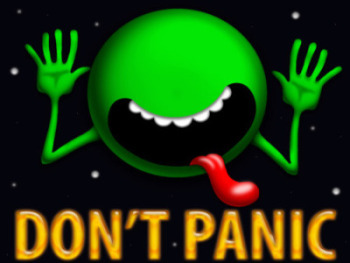 So today is known as Towel Day, in honor of Douglas Adams and his book Hitchikers Guide to Galaxy. So what we have in honor of this game is an annoucement from Hot Head games. They have recently partnered with Megadodo Publications to bring their book to our primitive portion of the galaxy. So soon we will be able to keep ourselves up to date on what what all the hoopiest froods are doing from this mostly harmless planet (until it is demolished for a freeway). Check out the the full press release below along with a link to the site that will be keeping us up to date on this. EARTH - 25thMay 2011 (Towel Day)- This press release communication has been approved by the Galactic Communication and Safety Board for distribution via your primitive electronic distribution networking systems. Hail people of Earth! Megadodo Publications is pleased to announce that we are working with the interactive entertainment development team Hothead Games to bring The Hitchhiker’s Guide to the Galaxy, the standard repository for all knowledge and wisdom, to the farthest uncharted backwaters of the unfashionable end of the Western Spiral arm of the Galaxy. This new edition of The Guide will be available not only on your planet but also on all nearby systems including Alpha Centauri. "We're super excited to be involved with such a legendary creation as The Hitchhiker's Guide to the Galaxy. The quirky and hilarious universe that Douglas Adams created became an instant classic for so many. All the hoopiest froods here at Hothead jumped on the chance to work on the project”, commented excitable Hothead human, Joel DeYoung. Zarniwoop Vann HarlaHarlH, president of Megadodo, was unavailable for comment as he is far too cool to add quotes to press releases. For up-to-the-Earth-minute communications on this exciting new addition to the Guide, use your fleshy digits to prod your plastic board of keys and visit www.thenewhitchhikersguide.com.